While there are many people out there who piss and moan about The Simpsons not being the series that it once was, that argument has gone beyond the statute of limitations now that the show is entering its 25th season. But even those who may complain until the end of time will more often than not tune in for that most famous of Simpsons episodes, the “Treehouse of Horror.” This year’s episode, premiering October 6, has a bigger draw than most, as it will feature an opening directed by none other than the fantastically macabre director Guillermo Del Toro, according to Bloody Disgusting. I’m assuming that means the above still was a part of it, which is kind of a rip, given the “ToH” episodes have already dipped into The Shining before. But whatever. I’m on board. Especially since I wasn’t one of the lucky ones that got to see this extended, monster-filled opening at Comic Con earlier this year. So not only are we finally going to see Del Toro’s work, but Fox also released all the plot details for the yearly episode’s three segments, along with some accompanying imagery. The first portion is a Dr. Seuss-inspired romp titled “Oh The Places You’ll D’oh,” and it features Homer riding around Springfield causing a bunch of trouble as The Fat in the Hat. Below you’ll see the kids freaking out over something, with Maggie’s hair definitely reminiscent of a Seussian character. Next up is “Dead and Shoulders,” in which Bart gets decapitated during a freak kite accident. Something that Charlie Brown never had to worry about. His head is then attached to Lisa’s body, and they’re forced to co-exist as one being. We’re not going to think about how they go to the bathroom. 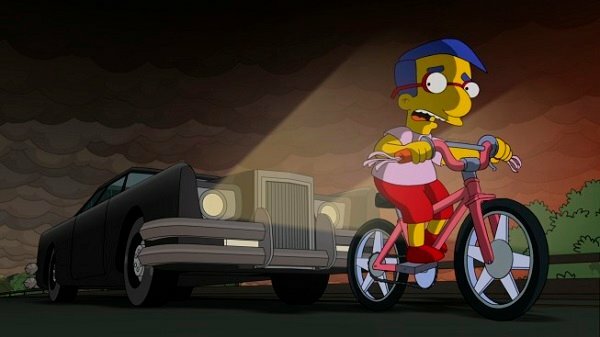 I’m going to assume that the next image is from this segment, and it features Milhouse biking away from an ominously evil-looking vehicle. The last tale of the episode sounds the most promising. “Freaks no Geeks” centers on The Burnsum and Baily Circus, Mr. Burns’ 1930s traveling circus, which stops in Springfieldland. Marge is a trapeze artist and Homer is a strong man who gets a tad upset when freak show Moe starts to make advances on Marge. I wish every segment focused on Moe. 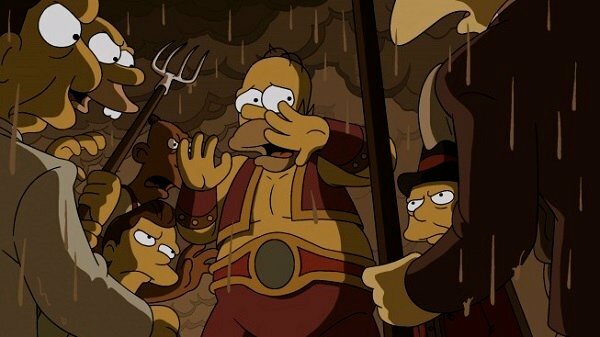 Below you’ll find strong man Homer hiding from an angry mob. An angry mob in Springfieldland? Who’d have thought? 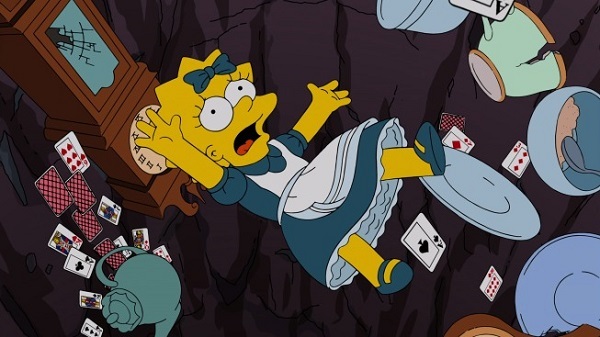 And then below is an image of Lisa falling down into Wonderland, seemingly. Not sure where this comes from, but I’ll be there on October 6 to see it live. 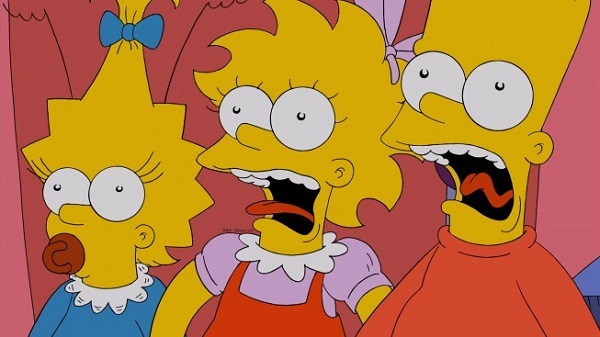 Below you’ll find the 13 best tales from “Treehouse of Horror” history. At least, according to the person who made the video. Enjoy!